We’ll get to see McLaren’s new track monster in action for the first time next month. The regular road-going Senna is already one of the most extreme cars McLaren has ever built, but it’s tame compared to its track-only sibling, the Senna GTR. McLaren unveiled its new track weapon last month but didn’t say when we’ll get to see it in action. Now, the automaker has confirmed the Senna GTR will make its dynamic debut at the 77th Goodwood Members’ Meeting on April 6, where the 1,900-hp Pininfarina Battista will also be shown in the UK for the first time. A final validation prototype McLaren Senna GTR will be put through its paces at the historic Goodwood Motor Circuit at the head of a special track parade celebrating McLaren cars featuring a McLaren P1 GTR, a McLaren P1, and the road-going McLaren Senna alongside the new GTR. For the first time, the famous XP5 McLaren F1 prototype , which held the world record for the fastest production road car, will also be joining its 21st century McLaren Ultimate Series descendants. Powering the McLaren Senna GTR is a 4.0-liter twin-turbocharged V8 engine that produces 814 hp and 590 lb-ft of torque. With a dry weight of 2,619 pounds, the new GTR has an astonishing power-to-weight ratio of 684-hp-per-tonne. 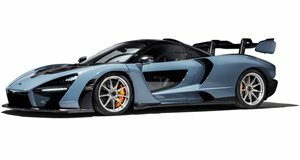 Thanks to the car’s optimized aerodynamics, the Senna GTR also generates more than 2,200 pounds of peak downforce, making it the most extreme track car McLaren has ever produced. Despite commanding an astronomical asking price of $1.4 million, all 75 examples of the McLaren Senna GTR sold out shortly after the concept debuted at the 2018 Geneva Motor Show. Customer deliveries are due to start this September. The recently unveiled full-size McLaren Senna made of almost 500,000 Lego bricks will also be on display at the Goodwood Festival of Speed in July.